As I write to you, I’m thinking about my grandparents—two Boricuas with tender hearts and questionable beliefs, like your typical abuelo y abuela. This past Thanksgiving was the first we spent together since I was four. I can imagine our conversations back then were little more than my random outbursts of excitement or sadness or fear, to which they would have responded with besitos and tight hugs. Now, I’m the one listening, waiting to offer a hug or kiss on the cheek. We talked a lot this holiday about their lives: how they’ve carried heartache across decades from Puerto Rico to New York, where they met, to New Jersey and Virginia, to the island and back again; the racism they’ve endured in the hospitals where they worked as a seamstress and an orderly, both of them so ready and willing to lay down everything for a slice of some American dream. Even now, they want to hold onto that dream. I listened to these stories of how they built our family with each other, and I learned about the pain they’ve inherited separately and passed down together—and what I have inherited and will possibly pass down, too. It’s been a time, as the holidays so often are, for retrospection. In our newest online installment, “The Seasonal Issue,” you’ll find work that also grapples with the past. There are tales about fresh, new, exciting love and love that untangles over time. Stories and poems that touch upon families fragmented by addiction or geography, or that are bound together so tightly by identity. There are musings, too, about our place in the world and the perceptions we hold. It’s an issue packed with heart. This issue is also very much a Latinx affair. I reached out to these 10 contributors—many of whom I’ve admired for years, and some whose work I’ve only been introduced to recently but will surely follow for years to come—over the past few months, asking if they’d like to submit work for a holiday Latinx issue that spoke to a singular, vague theme: “seasonal.” As a Latino editor myself, I wanted to carve out a space within Barrelhouse where Latinx writers and artists didn’t feel pressure to create work that was exclusively or limited to addressing their Latinidad. Unless it was what they wanted, on their terms. The final product feels like something special. Right now, I’m sure my grandma is in her coffee-perfumed kitchen, sliding her fingers in between the window blinds to peek at what the neighbors are up to. The temperature has dropped low enough outside for her breath to fog up the glass. My grandfather is probably chilling in his armchair, quiet and pensive, waiting for his next novela or news show to start. It’s a lovely time to sit back with a strong cup of Bustelo and dive into this issue. P.S. I’d like to leave you with something very Barrelhousey, pero en español. About the artist: Elianne Melendez is a Guatemalan-Salvadoran illustrator from a suburb in Los Angeles. She loves shoujo manga, horror films and blasting Los Hermanos Flores at the stoplight. You can learn more about her work on Twitter: @_eliyanii, and Instagram: @eliannemelendez. 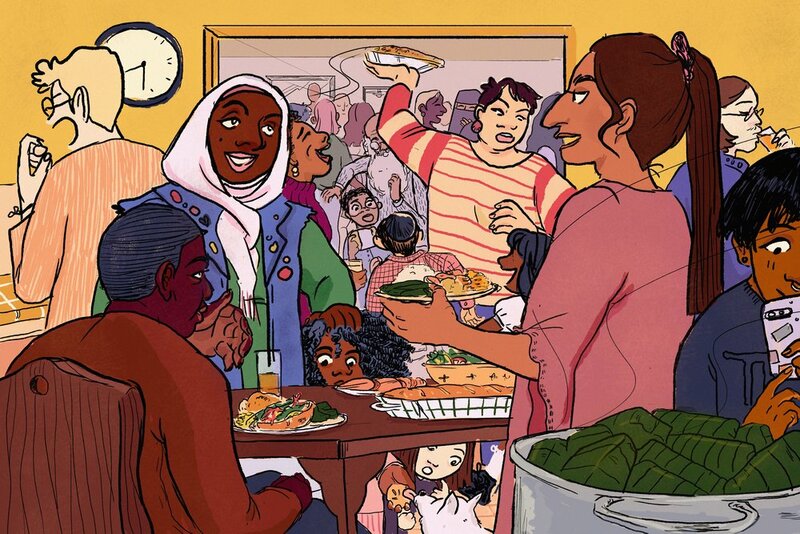 From the artist: The original concept of this zine came from a small drawing I did of the first panel, looking at when a multicultural family gets together for the holidays. We'll be looking at pictures that the family took, while others are rushing to get the food that one aunt makes ONLY during the holidays. It's a feeling of looking at everyone in a static vs. an active moment and how they contrast each other. The rest of the conversation that happens between the two female characters is a conversation that I always wished happened when I was young. The validation of knowing where I come from and how multicultural we are; I wanted to make a short clip of what would make young white-washed me feel seen and like I belonged, even in a simple way. Of course, that would be a lot to take in as child, for any child, and the way that the younger family member breezes past the conversation is how most children would process it. Listening and trying to understand what someone is saying, but their main focus is on the food. Altogether, this zine is for the young me not knowing who I was, and for others to find out who they are soon. Alex G. Carol is your neighborhood Afro-Latina who speaks three languages but isn't fluent in any of them! A comic artist, zine artist, and illustrator, she focuses on autobiographical and fictional storytelling using ink and watercolor. Currently residing in Philly, she wants to tell more stories about being Afro-Latina and how to embrace this identity in a colorist society. For more thoughts and doodles from a multilingual Afro-Latina who confuses her words way too much, follow her on Instagram @agcarol.illustrations.